Since the NFL’s free agency tampering period began on Monday, March 12, the New York Jets and former Los Angeles Rams cornerback Trumaine Johnson (74.2 overall grade) agreed to a five-year, $72.5 million deal, despite two years of middling play on the franchise tag. Richard Sherman (82.7) earned a deal worth roughly nine million dollars a year from the 49ers, despite being cut by the Seahawks just days earlier. Brent Grimes (82.0) was able to get $10 million in a one-year deal with the Bucs, despite being 35 years old. While those outside cornerbacks did quite well for themselves, top-end slot cornerbacks like Patrick Robinson (89.8, four years, up to $20 million), Nickell Robey-Coleman (84.9, three years, approximately $15.75 million) and Aaron Colvin (80.0, four years, $34 million) are (still) earning relatively less money when they reach the open market. Tyrann Mathieu (77.0), one of the best overall defensive players in the league just a few short seasons ago, was cut recently by the Arizona Cardinals due to a “poor scheme fit.” Kendall Fuller (90.0), arguably Washington’s best defender in 2017, was dealt with a third-round pick for an aging quarterback in lieu of having to pay Kirk Cousins. In a league where the vast majority of the highest-graded cornerbacks (on a per-year basis) are predominantly outside cornerbacks, a good open question exists as to whether teams are approaching the slot with appropriate financial tenacity. 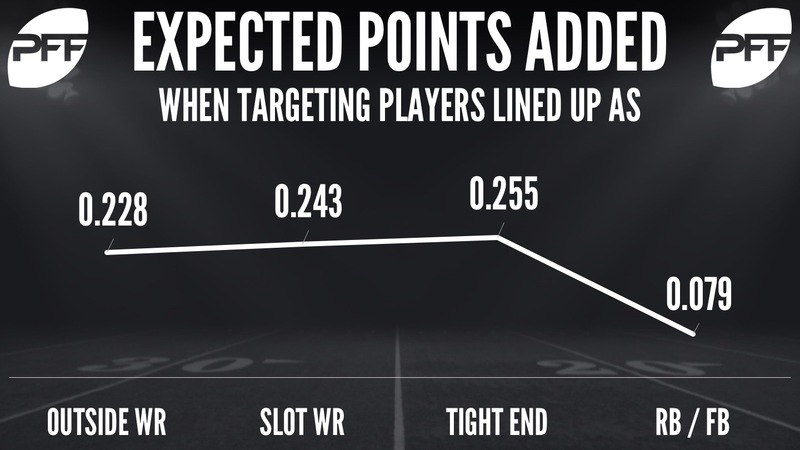 During the PFF era, throwing to slot receivers has been worth approximately 0.243 expected points added (EPA), while throwing to outside receivers has yielded only 0.228 EPA. When looking at the distribution of these throws, the difference becomes even larger, with the median EPA throwing to guys out of the slot being 0.200, as opposed to 0.130 for outside guys. Thus, throwing to inside receivers is not only a better play, it’s a safer play for offenses (and hence defending such a play well comes at a premium for a defense).